IF YOU HAVE NOT READ THROUGH THE STARS ARC OF THE MANGA PLEASE DO NOT READ ANY FURTHER AS THIS THEORY CONTAINS SPOILERS FOR THE END OF THE MANGA! FYI: I haven't put a ton of thought and research into this. It's really just an idea I like to entertain because I like twisted stories that have darker aspects to them. OK SO! I just got done reading through the Manga again and something jumped out at me that I never noticed before. 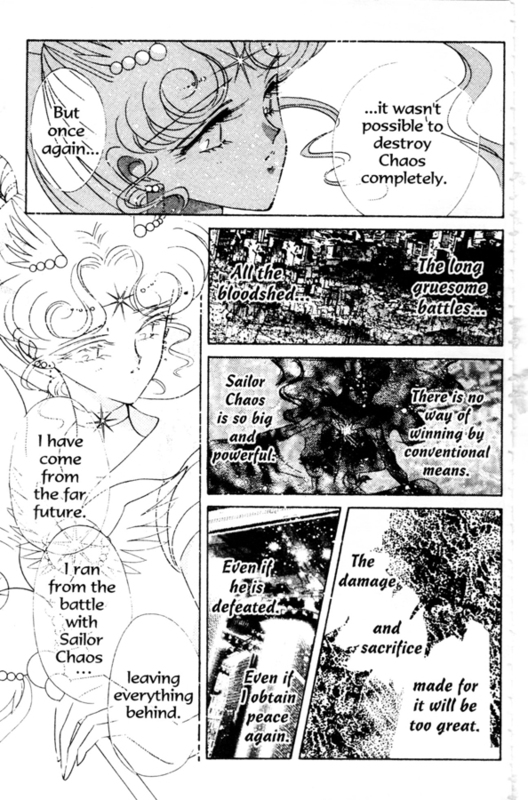 This is Sailor Cosmos talking about the distant future where she has been battling Sailor Chaos. She talks about how long and gruesome the war has been and how she has lost EVERYONE that she loves to the fight. Now I'm not sure if it was just a translation issue, but on this page Cosmos specifically refers to Sailor Chaos as a "he". I checked this translation with the 2003 reprint but in that translation Cosmos only refers to Chaos by name or as "the enemy". Upon reading this I had to pause and really think through all the arcs of the manga because it dawned on me that we've never seen a male senshi before. Except maybe, one. No he's not technically a senshi but his star seed is a sailor crystal, he has powers of his own, in the Infinity arc he actually has his own transformation scene, and he's a protector of Earth. And who's to say that male senshi don't differ from female senshi? There's also the large possibility that Sailor Chaos is a senshi that we've never met before and is a completely separate entity to the characters we know. But you gotta wonder, what if? What if after the the events of the Black Moon arc and after Chibi-Usa has grown and become a full fledged senshi, Usagi and Mamoru pass the crown to their daughter and live the rest of their lives together. What if after they've moved on from that life they're reincarnated again - this time Usagi blossoms into the beautiful and incredibly powerful Sailor Cosmos. What if something happens to Mamoru's star seed in the Cauldron, and he comes back corrupted? What if by chance, the Cauldron reincarnates him into the catalyst that spurs Sailor Cosmos' awakening? When we meet Cosmos in the manga she informs the reader that she has the power to "lose and save everything". If that's the case then logically that would include Sailor Chaos. So why is she so reluctant to use this power to finally end the war? She's already stated that everyone she loves has been lost, so what does she have to lose? Unless Chaos is also someone that she cares about and doesn't want to lose like she has everyone else. I also think that's the reason she decides to come back as Chibi Chibi. She wants her past self to destroy the Cauldron so that Mamoru never comes back as Chaos. She would rather erase any chance of the war and their reincarnation even happening, so in her grief she makes the rash decision to try and destroy the Cauldron completely, therefore erasing her future but also the future of all the other stars and lives in the universe. Thankfully Usagi shows her that doing that isn't the right choice, but why would Cosmos have even considered doing that unless she wanted to avoid the pain of fighting her soul mate? Oh, it's interesting! The really out there crack theories are (usually) the most fun. I'd kinda like to know exactly what the original Japanese translation says, but it's a neat proposition. Considering this is Miss Dream, it's most likely a mistranslation. Japanese don't normally assign genders in sentences the same way we do in English, they don't tend to say he/she at all unless they don't know the person's name. I just checked my Kanzenban version and that line says "Tatoe taoshitemo" which just means "Even if defeated" with no subject gender indicator at all. Oh my gosh, I've thought about this theory for such a long time but I never even considered those reasons. I always considered Usagi and Mamoru to be counterparts and with Usagi having a connection to Sailor Cosmos who is essentially supposed to the be embodiment of everything good then who's the one with a connection to Sailor Chaos? I always saw it to be Mamoru. Usagi and Mamoru have a lot of parallels going on from the yin/yang symbolism to astrology to personality differences to design standpoints. This would only up it to eleven.